Amerikansk Kunst 1950-1970, Louisiana Museum of Modern Art, Humlebaek, Denmark, 1971, no. 59, cover illustration. Masters of the 19th and 20th Centuries, Marlborough Fine Art Ltd., London, 1972, no. 78, repro. Mark Rothko, 1903-1970: A Retrospective, Solomon R. Guggenheim Museum, New York, 1978, no. 111. Mark Rothko: Subjects, High Museum of Art, Atlanta, 1983-1984, unnumbered catalogue, repro. Mark Rothko 1903-1970, The Tate Gallery, London; Fundación Juan March, Madrid; Museum Ludwig, Cologne, 1987-1988, no. 40 (London catalogue), no. 20 (Madrid catalogue), no. 33 (Cologne catalogue), repros. 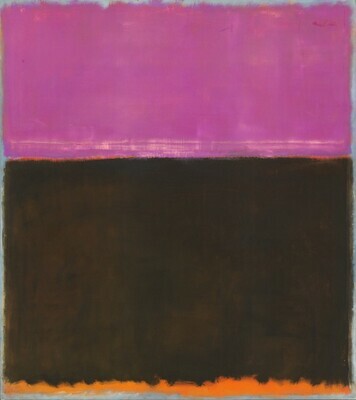 Mark Rothko, Kawamura Memorial Museum of Art, Chiba-ken; Marugame Genichiro-Inokuma Museum of Contemporary Art; Nagoya City Art Museum; Museum of Contemporary Art, Tokyo, 1995-1996, no. 30, repro. Mark Rothko, National Gallery of Art, Washington, D.C.; Whitney Museum of American Art, New York; Musée d'Art Moderne de la Ville de Paris, 1998-1999, no. 57 (NGA/WMAA cat.) and no. 31 (Paris cat. ), repro. Mark Rothko: A Retrospective, Gemeentemuseum Den Haag, The Hague; Hangaram Art Museum, Seoul Arts Center, Seoul; The Museum of Fine Arts, Houston, Houston, 2014 - 2016, unnumbered catalogue. Clearwater, Bonnie. Mark Rothko: Works on Paper. New York, 1984: 40, repro. Eliminating the Obstacles Between the Painter and the Observer: The Mark Rothko Foundation. New York, 1986: frontispiece, repro. ABC de las Artes 1 (1 October 1987): 12, repro. Strick, Jeremy. Twentieth Century Painting and Sculpture: Selections for the Tenth Anniversary of the East Building. Washington, D.C., 1989: 76-77, repro. 78, 79. White, James E. Introduction to Philosophy. Saint Paul, 1989: cover ill.
Grunenberg, Christoph. Mark Rothko. Washington, D.C., 1991: 14-16, cover repro. American Paintings: An Illustrated Catalogue. National Gallery of Art, Washington, 1992: 318, repro. National Gallery of Art, Washington. National Gallery of Art, Washington, 1992: 269, repro. Sepulveda, Luis. Der Alte, der Liebesromane las. Frankfurt am Main, 1994: cover ill.
Anfam, David. Mark Rothko: The Works on Canvas: Catalogue Raisonné. New Haven and London, 1998: no. 493, repro.